Once in a while, you encounter something that is truly extraordinary. Something created by a unity of human effort and ingenuity and natural processes that is a sacred and inspirational place. I want to share one of those places with you today–both because its a wonderful opportunity to learn, but also to see so many sustainable living activities in action. I’ve written about sacred gardens before–and this is truly such a place. 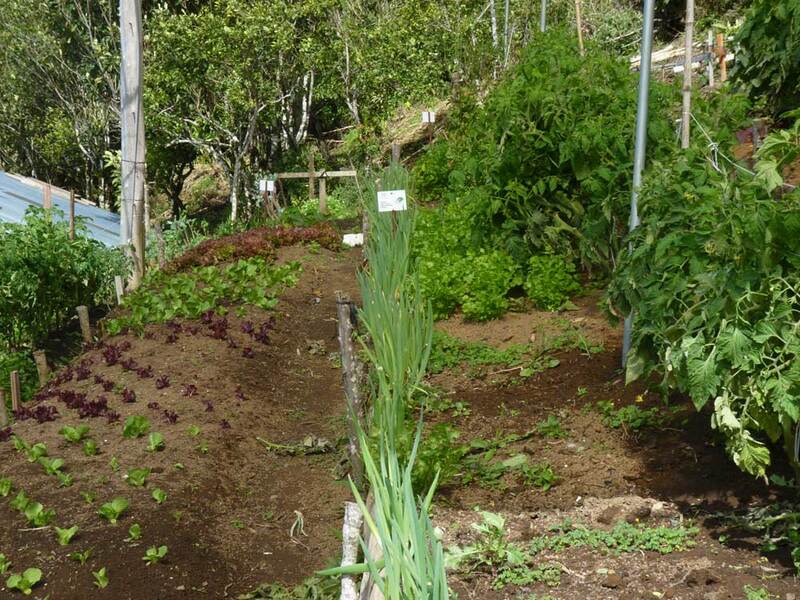 While I was in Costa Rica, my friend and I literally stumbled across this amazing organic vegetable garden behind the Hotel Belmar in Monteverde, Costa Rica. 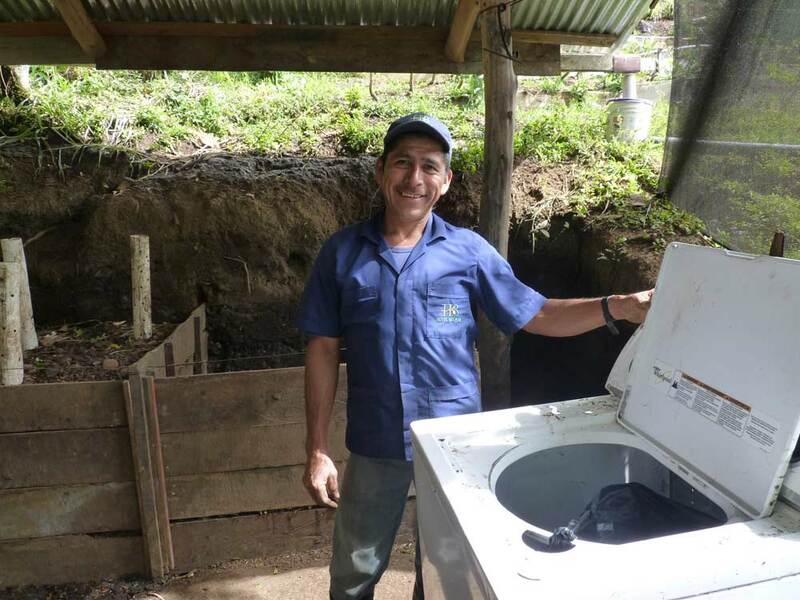 Roberto Mairena is the sole farmer of this land, and he works with joy in his heart and s smile always on his face. Although he spoke little English and we spoke little Spanish, we learned a great deal from him, seeing so many of the principles that we were working to learn and enact in the USA at play in his garden–all in one place. Truthfully, this was the most inspirational and incredible garden I have ever visited (and I have certainly visited my fair share!) 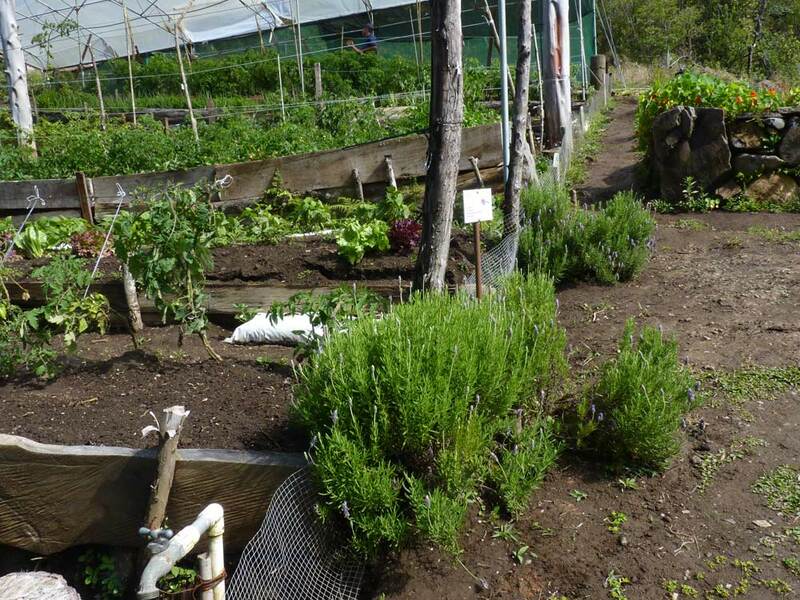 What was so inspirational is that Roberto was literally doing everything himself and doing everything right and was, with the exception of imported chicken manure and a few bioferment ingredients, a closed loop system (that is, the garden largely sustains itself rather than taking nutrients and materials from other places). You read about this kind of garden in books, and a lot of people are “working toward” this kind of thing–but here it is, all in one place, with so many things going on and so many little features that add up to an incredible whole. My friend Linda, a 30+ year experienced organic farmer and agricultural educator herself, was blown away with this place. She and I spent over an hour exploring and photographing and documenting everything (so that we could learn), and then we spent almost an hour talking with Roberto and communicating in the language of plants with lots of excited pointing. Robertos garden was also fully integrated into the hotel, which also is important to recognize (I have never seen a hotel in the US that had such a practice–much of the food served at the hotel came from the garden, less than 100 feet away). I am going to give you a virtual tour of his garden, and talk about some of the exciting features and what we can learn from his approach. I will say that this blog post is going to be a bit long and full of photos–but if you want to learn how to garden in a really sustainable, sacred way, its worth following along! 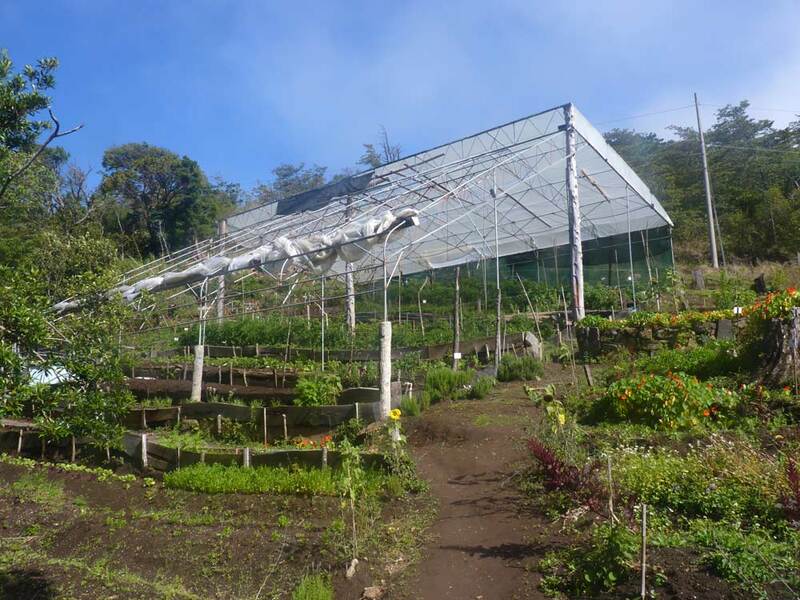 We estimated that Roberto was farming about 5000-6000 square feet, and had over a 1/4 acre plot in cultivation in total–and he was able to grow amazing amounts of food and cultivate an amazing amount of diversity in that small space. Our Spanish wasn’t good enough to ask Roberto how many hours he worked in the garden each week, but from the love and care and attention to detail, we think that its likely a full time position (or close to it). We know this approach could be replicated on a smaller scale with effect. The whole garden from the entrance! One of the key features of this garden is how it uses the landscape, and the slope of the landscape, to effect. You can see the paths winding upwards, the slope catching the southern sun. The garden also has this wonderful, whimsical quality that is hard to put into words. There is a lot of joy growing here! Roberto was growing using only organic methods. This means no chemicals, no synthetic fertilizers, nothing that would harm the ecosystem or ourselves. He’s also employing nearly all of the methods used for biointensive farming, so we would classify his approach as organic and biointensive. There’s always discussion among permies, gardeners, and farmers about how to best prep your beds for planting annual veggies (perennials are another matter). Do you double dig it (using a biointensive method) or sheet mulch it? Roberto favors the double dig method, and let’s just say his soil is the most beautiful, spongy, amazing thing, so that’s winning some points in my book! An old washing machine hides a trash bin. 2) Additions of Eggshells and Ash. The soil of Costa Rica is quite acidic (as evidenced from the stunning blue hydrangeas growing all over the countryside). 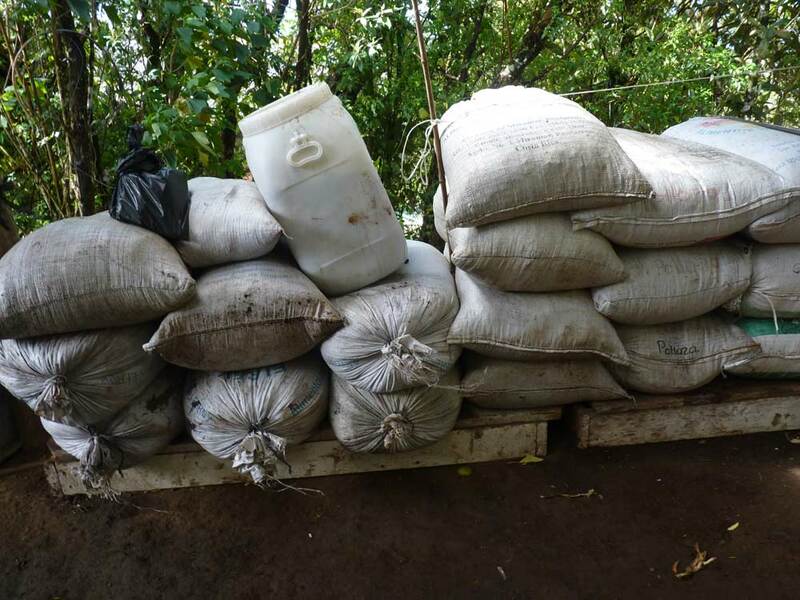 To counter this, Roberto uses substantial amounts of wood ash (which adds potash and trace nutrients and is highly alkali). 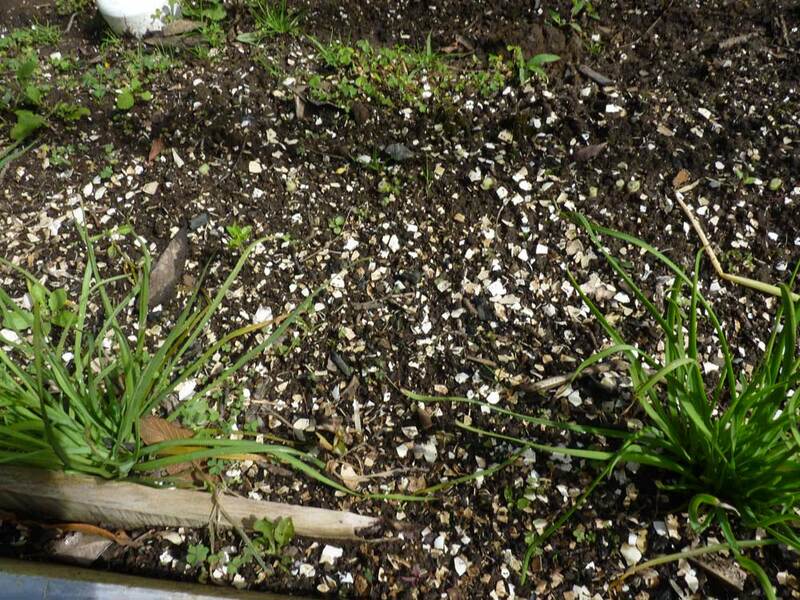 Crushed eggshells add long-term calcium back into the soil. 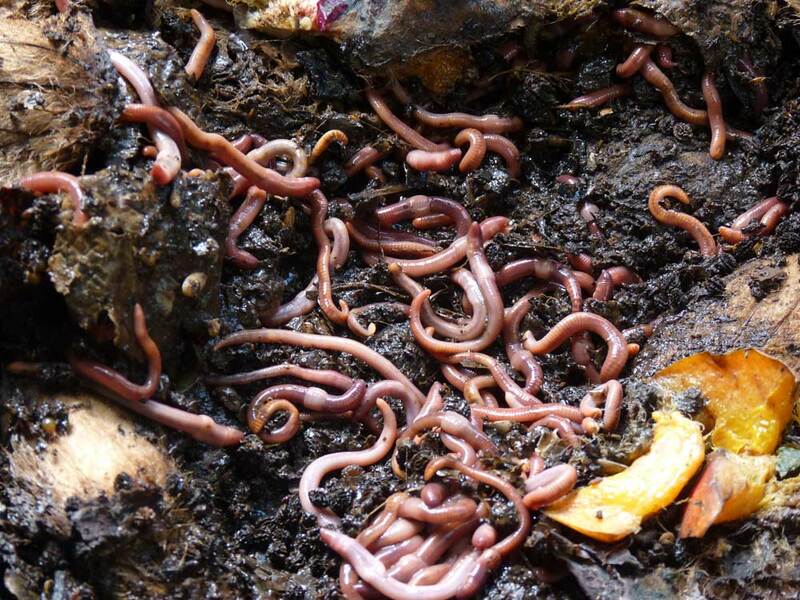 3) Worm castings (red wiggler worms eating compost from the hotel; break down mangoes and some limited veggies). Roberto used some repurposed plastic trays and had stacks and stacks of the worms in the trays. 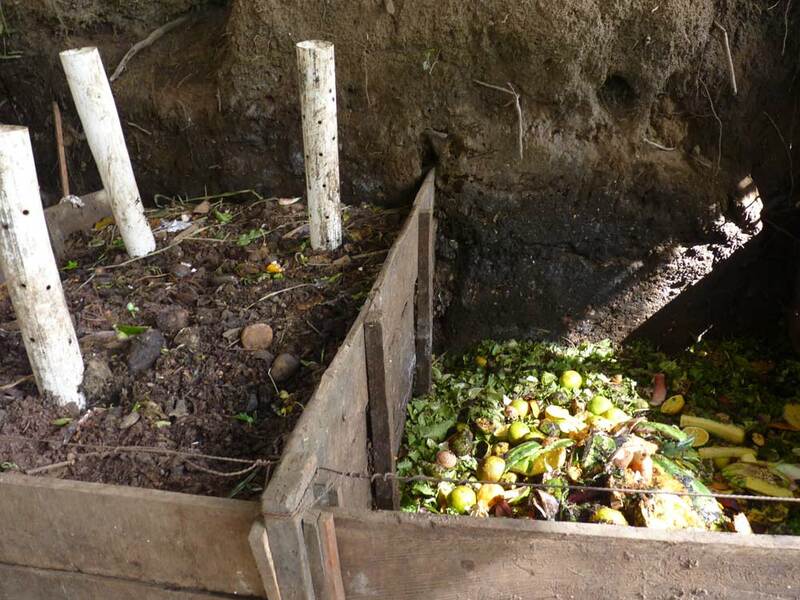 They made short work of the mangoes; the pits went back into the regular compost. 5) Bioferments of various kinds (again, more below). 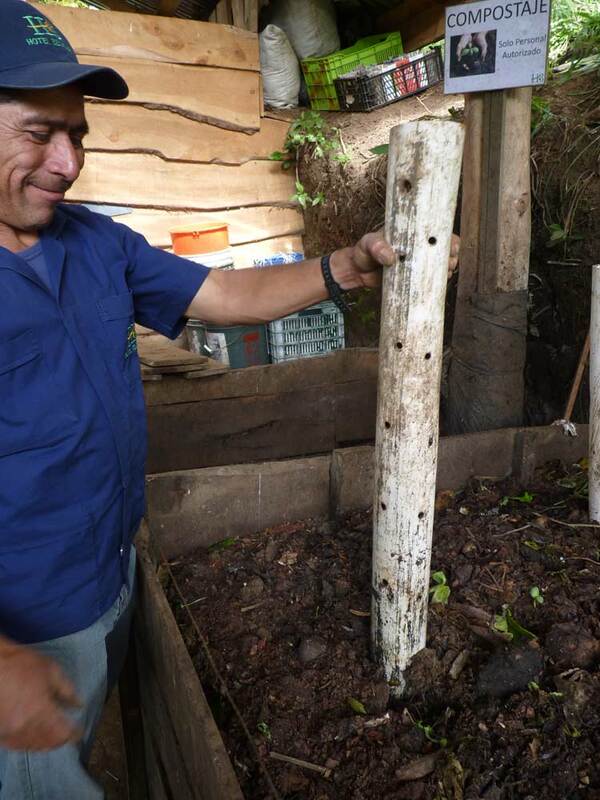 Roberto has a few tricks up his sleeve to make really amazing compost. First, he uses four different bins, plus worm composting, to break down material as fast as he can. After the worms have eaten the flesh of some fruits and veggies, he throws the harder bits right into the main compost bin. Then, as it fills, he uses a series of repurposed PVC tubes with many holes drilled in them to provide aeration without having to turn it (this is just brilliant!). 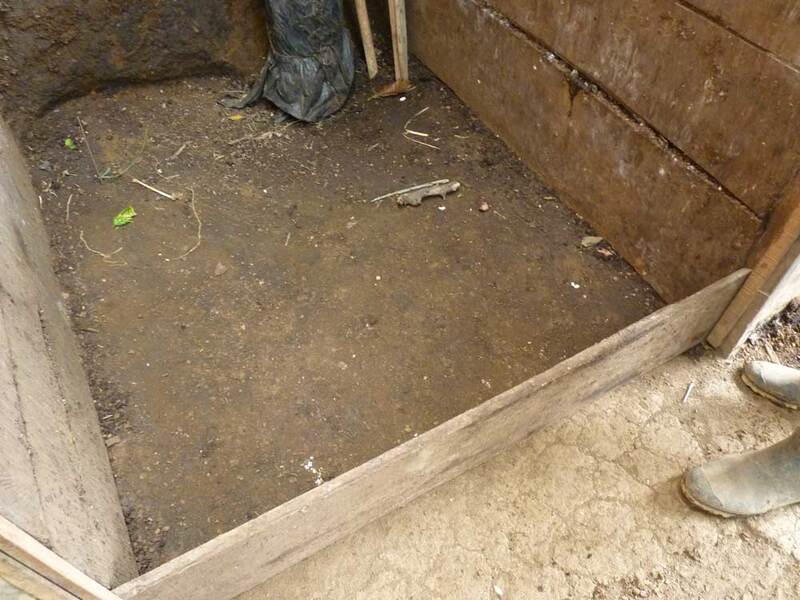 Finally, he makes compost removal easy with a series of removable flat boards, so once the compost is ready, he can simply remove the boards and rake it into the middle of his work area (you can see this in the photo below). 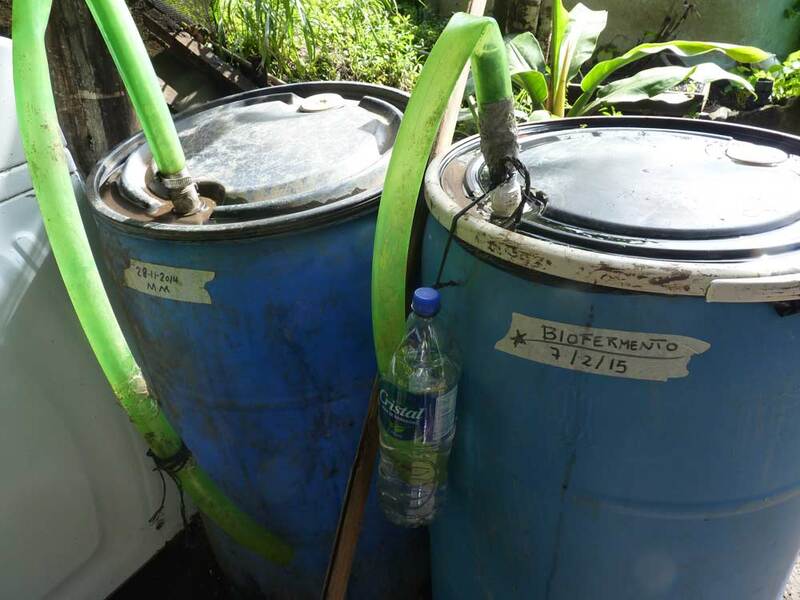 Frankly, learning about these methods alone were enough to make the entire trip to Costa Rica worthwhile! 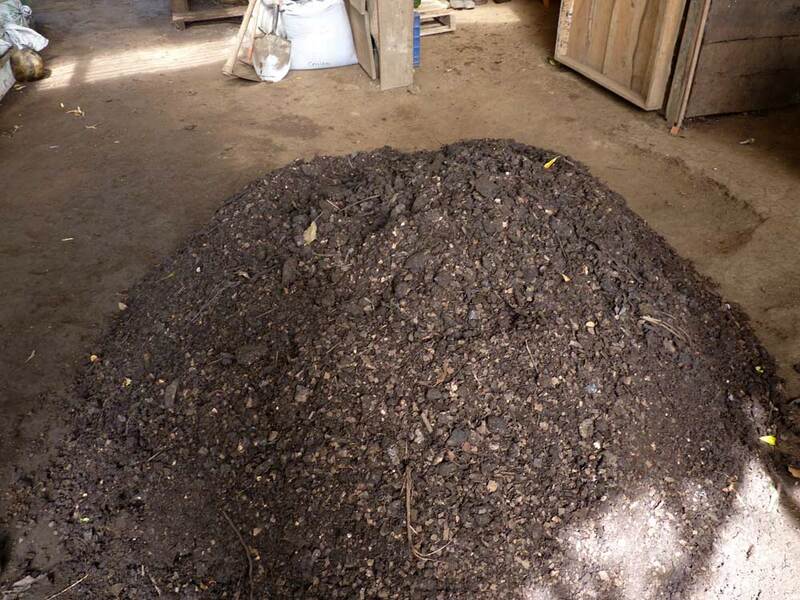 Beautiful pile of finished compost! I’ve made bioferments with just comfrey, but Roberto was taking this to an entirely new level. 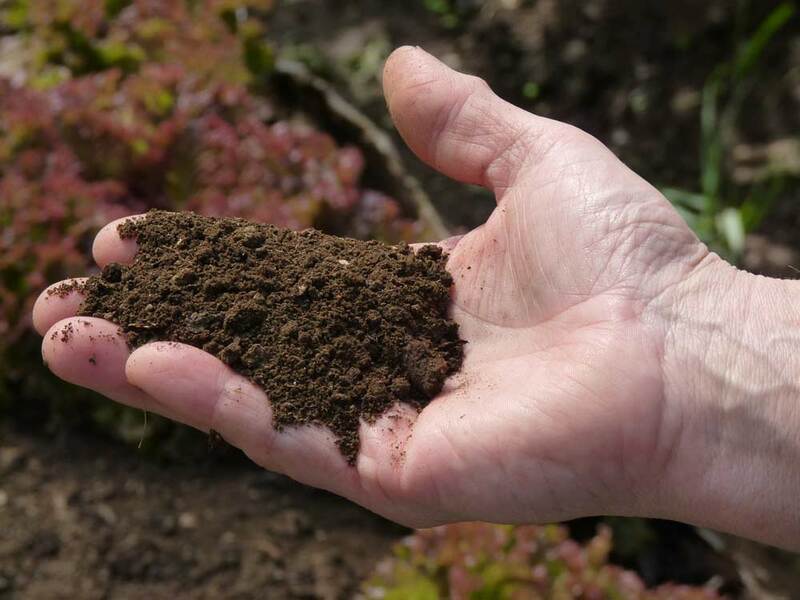 He’s using bioferments to add substantial trace minerals and microbial activity to his already beautiful, living soil. Another ferment, this one using chicken manure. We didn’t figure out how he made it. 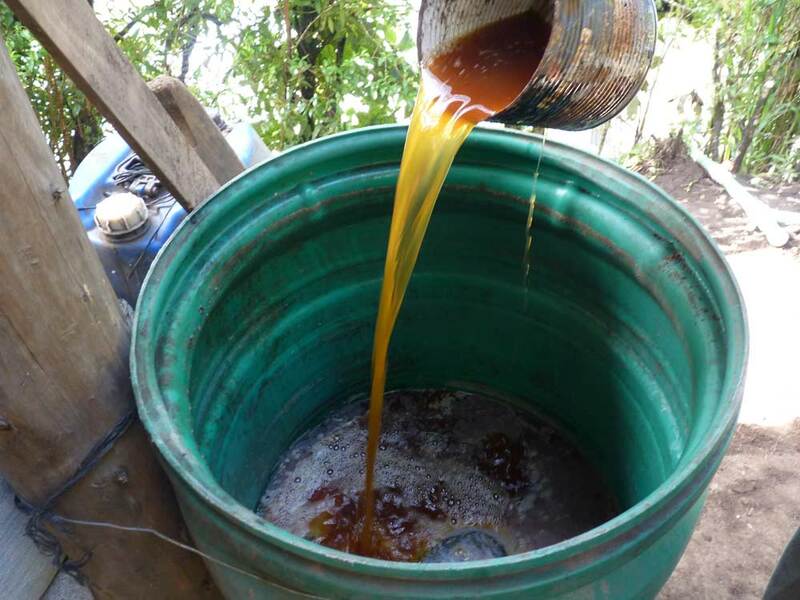 We asked Roberto for his Bioferment recipe, which he was happy to give us, and we translated the last bits with help from blog readers! I plan on making some of this quite soon. Roberto also uses his edges and margins wisely (a principle from Permaculture Design). 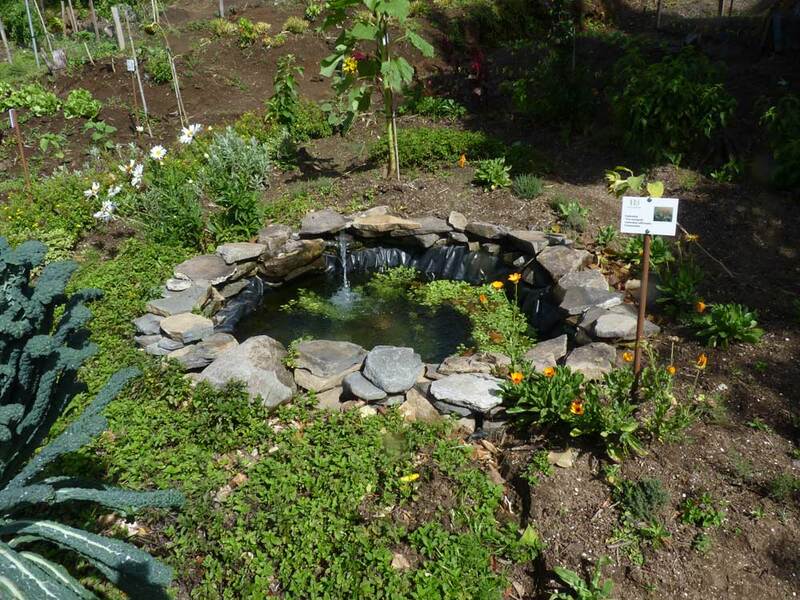 On each edge of the garden bed, he has herbs to encourage certain kinds of beneficial insects and keep away pests and problematic insects. 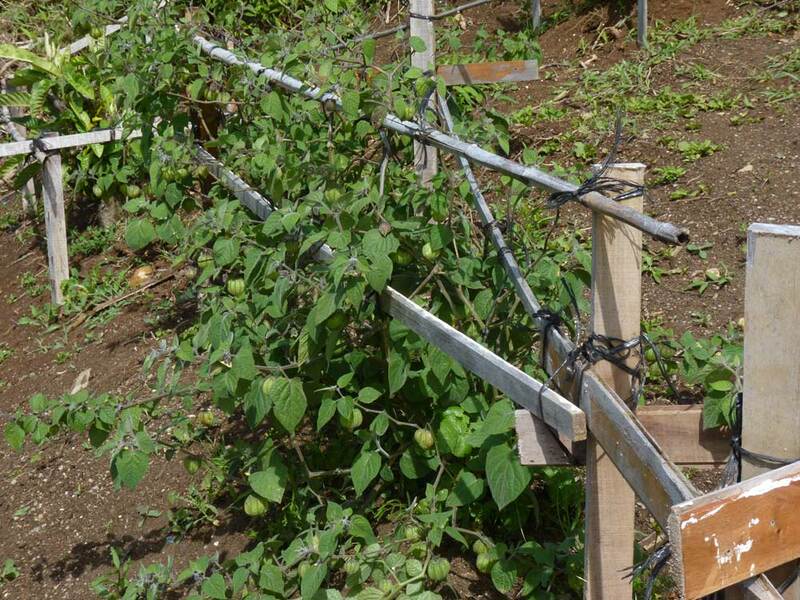 He also uses trap cropping throughout the garden (where one plant will be grown as essentially the sacrifice for the pests so that the other crops are left alone). 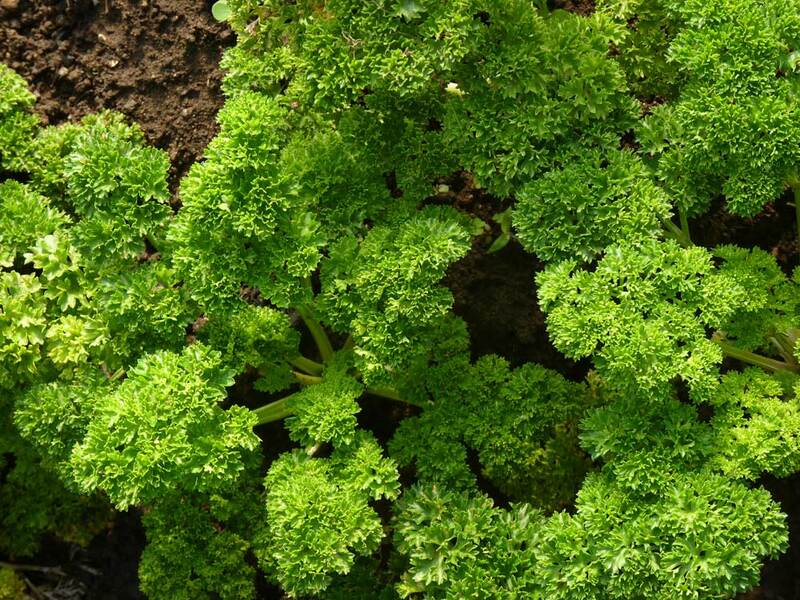 Border herbs and more trap crops – lavender, parsley, chives. Hardware cloth keeps out small critters but doesn’t take away from the look of the garden. 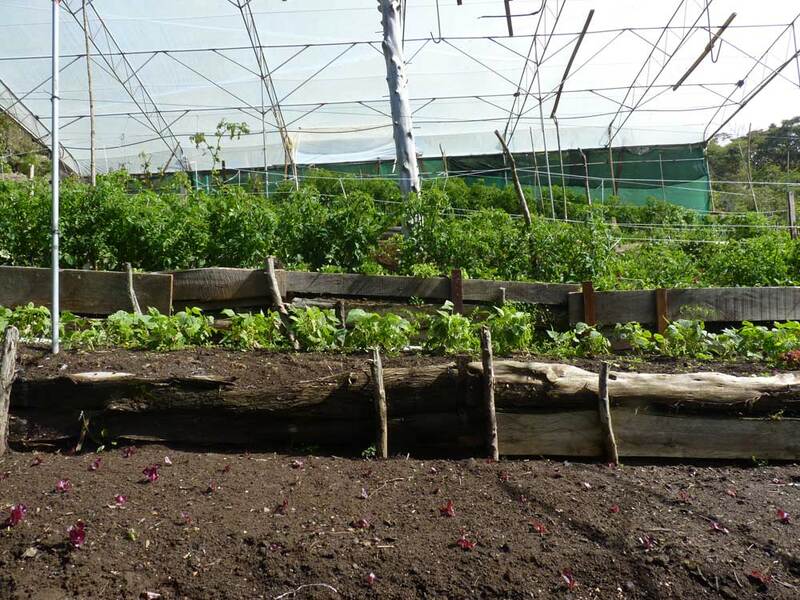 Roberto favored smaller, shorter rows with lots of companion planting. Strawberries were planted in many rows (also in white bags, you can see this in the photo above, to reflect the heat and keep them from spreading). He also used the metal roof of his shed to catch rainwater and send it into a cistern for watering. 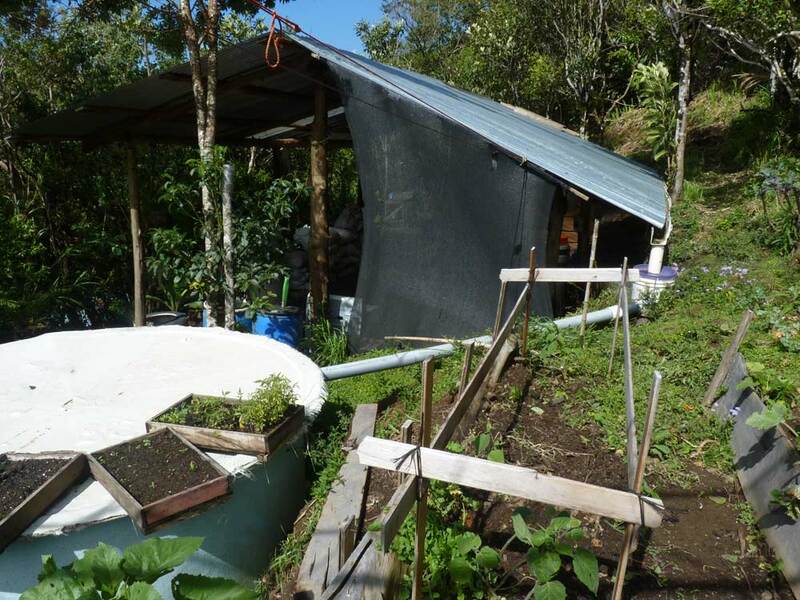 Drip irrigation lines and a simple pump moved the water where it needed to go up or down the hillside and into the beds. Rainwater harvesting and seedling trays ready to go into the soil! 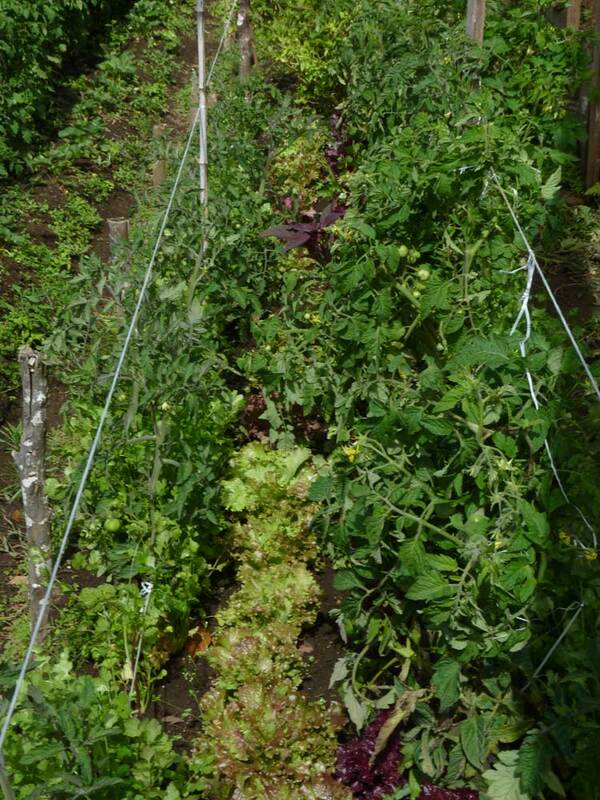 Part of the biointensive method is cultivating less area but always having something growing in that area. 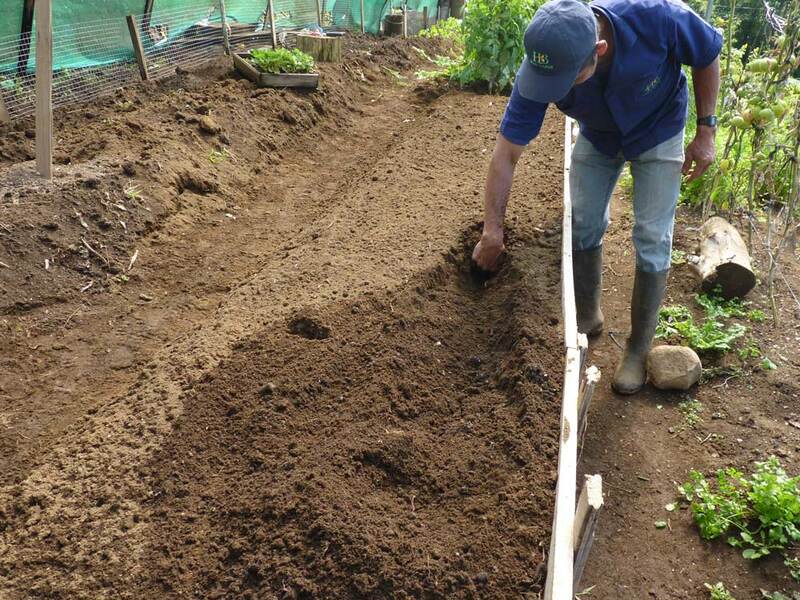 Roberto is doing this quite effectively–when we arrived, he was clearing out beds of old and dying tomato plants, prepping the soil, and immediately putting in lettuce and spinach seedlings. 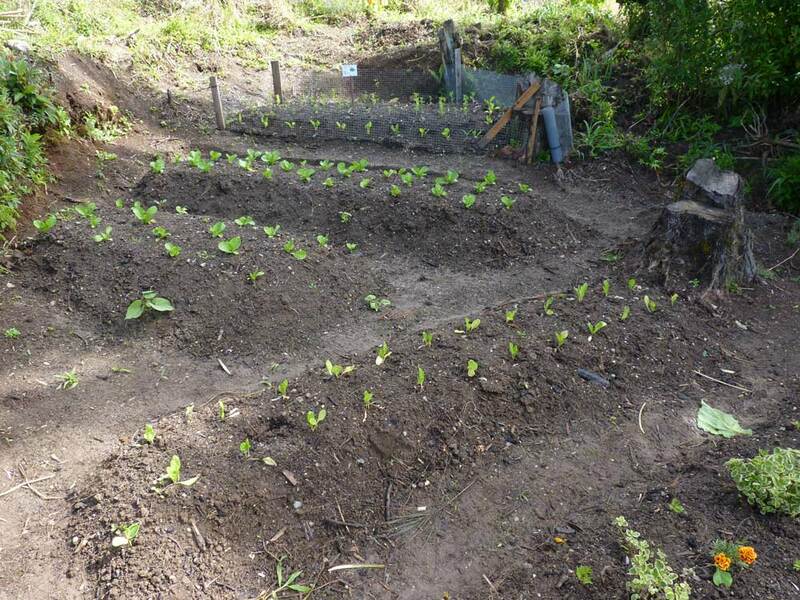 This continual crop rotation (much easier in a climate like his, but still do-able anywhere!) means that there is always something growing (often more than one something using companion planting methods) and the harvest is staggered over the season. 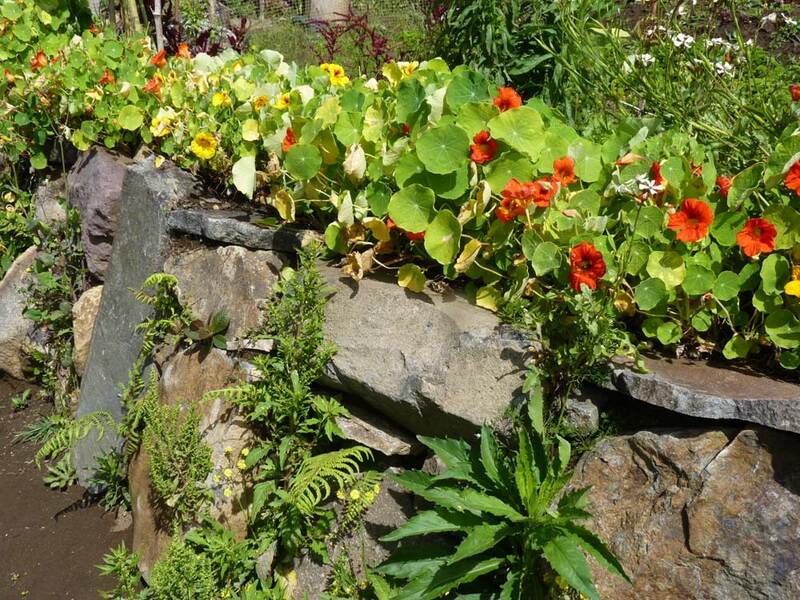 Another key aspect of Roberto’s approach was to integrate annuals and perennials, especially on the edges of the bed. 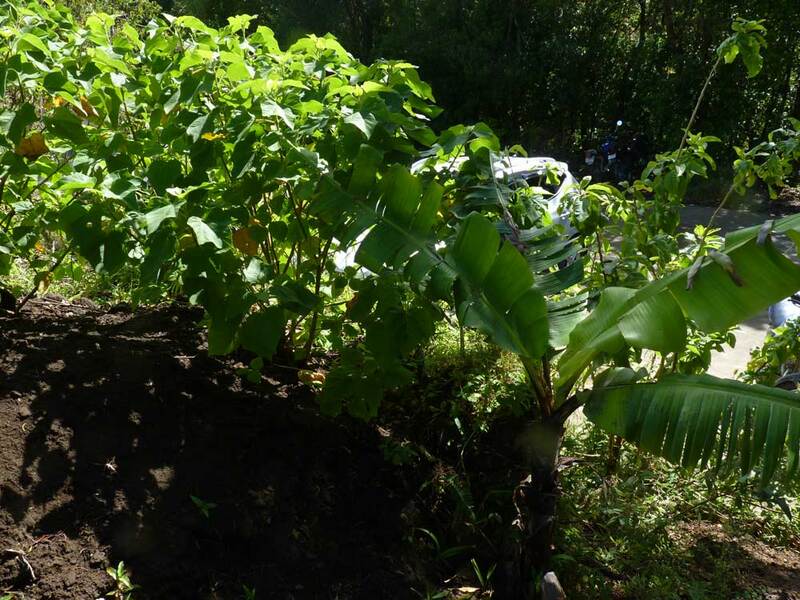 Although many of the plants we grow as “annual” are perennial in Costa Rica, he also integrated treecrops and agroforestry along the edges of the garden for even more growing power. 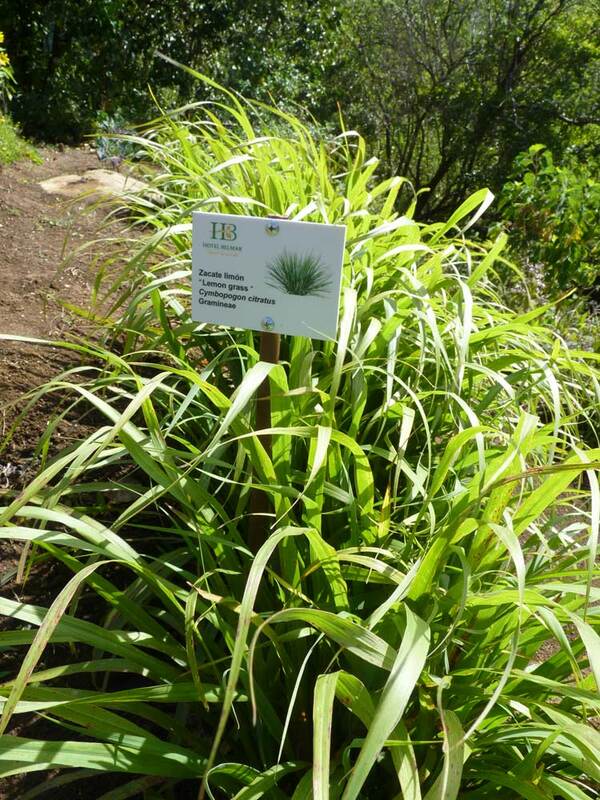 Growing so many different herbs–here is lemongrass! To conclude, every part of this garden, from its use of the natural features of the landscape to the use of the energy flows and “waste streams”, is carefully thought out and beautifully executed. I know there is a lot more going on here than I can share, but as you can see, its really a sacred space. I can only hope that one day, my gardens will be half as sustainable as Roberto’s were! 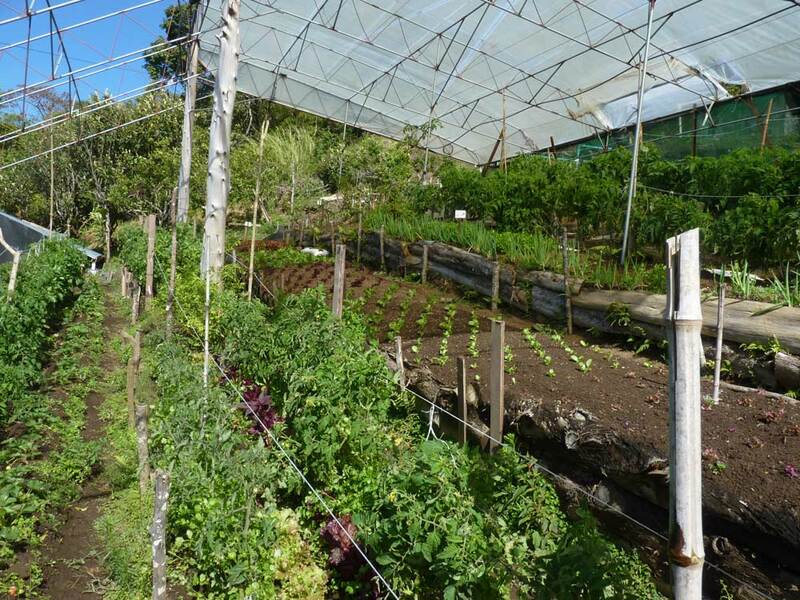 It was truly a delight to stumble upon this gem in the heart of Monteverde–I am inspired and amazed!